Dan Klarer: From Combat to Chekhov! Monday marked our first first official day of rehearsal for our realism project. We are using scenes from Chekhov's Three Sisters. I am playing Andrew, the only brother of the girls, with Nicole Ubbelohde as Olga, Claire See as Masha, and Claire Winkleblack as Irina. Special guest appearances with Keith Warwick as the wretched Ferapont and Becky Ormond as the confused and loathsome Natasha. In these first two days we have gotten through the first half of the scene. Monday's sessions and Tuesday morning's session was only the girls. Today, we finally got to Andrew's entrance which threw a nice wrench into the dynamic the girls had been creating. We have been doing some great base work going through wants/obstacles/subtextual wants beat by beat. It has also been nice to warm up together on top of some nice "family" discussions. Today we even did a little improv. We made up a scene as if the siblings father's funeral had just ended. The first time there was some forced talking and some coaxed speeches. The second time through we tried doing the scene without speaking. It was very interesting. There were a few times when I felt like Andrew should speak, to break the tension, but then didn't. The levels of emotion, tension, and awkwardness/shock that were created between each character's relationship with each other was fascinating. I thought it gave me a lot deeper understanding of the family dynamic and Andrew himself. There was also a surprising amount of humor/light-heartedness during our little improvs. I took this as a good sign. It certainly felt like I was in a Chekhov play. On Monday I taught my first of hopefully many stage combat classes in basic unarmed to the cohort. It went very well. Everyone seemed very engaged and they were mostly picking everything up fairly efficiently. It's always interesting for me as a teacher to lightly push the bounds and see how far into left field I can take students, especially on the first day when activities are relatively easy. This is my first teaching opportunity in a classroom with a full group of beginners since I finished my Dueling Arts International Teacher Training Workshop this past June. It's very exciting! I immediately felt at ease in front of the group leading warm ups (which I love and probably do to many of instead of start class). It has also been great for me to be able to incorporate elements from techniques and exercises we have been exposed to in the past few weeks as part of our training. Because many of them are similar to things I've done in the past I can put my Dan twist on them. We did some great partnering exercises and got through two kinds of pushing and shoving and everybody learned the basics behind a good 'ol fashioned proscenium slap. Next class will develop some more partnering skills and they will find themselves slapping and punching each other in different ways! Yeah! FUN! Also on Monday night we took a nice field trip to see Ewan Downie's Company of Wolves devised work of Seven Hungers. It is definitely a bit of a stretch for the non theater person, but I found it fascinating. More than anything, I wanted to be in it and doing it. Digging in. Exploring the work. There were some really nice yet haunting a cappella songs sung in I believe what was Russian. On of the most jarring events was when they took turns being eaten by the others who had the demeanor of feral beasts/wolves. The exploration of hunger as it relates to other wants including love and affection as well as actual hunger/bloodlust was really interesting. I was especially engaged during a scene where one of the men and one of the women tested each other out by tapping on each other's body parts using a live microphone. The place they got to when the microphone was sort of both on their teeth with them mouthing each side of the mic was quite funny and sweet and innocent. I love which innosense on stage. It is so unbelievably captivating. I think that's why I like mask work so much. 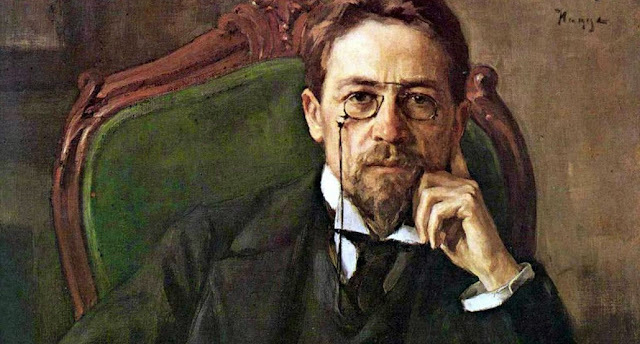 Well, here's to understanding more Chekhov this week.